Clip and save, folks. In a few short words, I hope to help you save hundreds, maybe thousands of dollars this year. Computerless? Your local library has one you can use. To appease critics of the hugely profitable pharmaceutical giants, most all drug companies have free “Patient Assistance Programs” for folks with income somewhere between Medicaid* and the upper limits of the government’s poverty level. If you can’t afford your prescriptions, this is where to begin. A complete list of pharmaceutical companies and their toll-free number is at Suddenly Senior’s Drug Assistance Page. Once you call them, get their application and return it with your prescription, doctor’s signature, and proof of income (assets are not usually considered), you get your medicine. Free. Generally, it’s a 90-day supply, after which you sometimes must reapply, going through the same routine again. Often, instead of mailing your medicine to you, just to tick you off, you must pick it up at your doctor’s office. If you’re broke, this is truly a lifesaver. Swallow your pride, and take your medicine. Also, check your state’s senior programs. Although most are tapped out, some states still have help for those who need it. A list of state programs and their toll-free numbers is at How to Get Cheap Drugs: A Senior’s Guide to Free Medicine. If you’re a vet, there’s an excellent chance that you can get your drugs for a mere $7 co-payment. In 1996, Congress dropped eligibility requirements. You probably qualify. Call your local Veteran’s Affairs at the number listed in your phonebook’s green pages. Pfizer’s Share Card Until Sept. 1, 2004, this card got you a month’s worth of any Pfizer drug (Lipitor, Viagra, Zoloft, etc.) for $15 at your local pharmacy. However, Pfizer now suggests that patients sign up for the U-Share Medicare Card. I personally tried just this and was refused. Go figure. Call 1-800-717-6005. Or 1-800-459-4156. LillyAnswers Card provides a 30-day supply of Evista, Humulin, Prozac or other Lilly medication for just 12 bucks. Restrictions mirror Pfizer’s. Call 1-877-795-4559. Cards like this may save you 50% or more on drugs. GlaxoSmithKline’s Orange Card saves seniors 30 – 40 percent off retail prices of Advair, Serevent, Avandia, Flonase, Wellbutrin, or any of this manufacturer’s drugs. Eligible seniors are enrolled in Medicare, lack drug insurance, and have annual incomes at or below $30,000 per person or $40,000 for a couple. Call 1-888-672-6436. Novartis’ CareCard saves senior citizens 30 – 40 percent or more off retail prices of Diovan, Lotensin, Lamisil, Lescol or any Novartis medicine. Qualification requirements are similar to the others, although here you must make less than $28,000 for an individual, $38,000 for a couple. If you earn less than $18,000/yr ($24,000/couple), you may be able to get a Novartis drug for $12/mo. Call 1-866-974-2273. If you qualify for one card, but not another, ask your doctor to substitute a similar drug made by the manufacturer whose card you have. 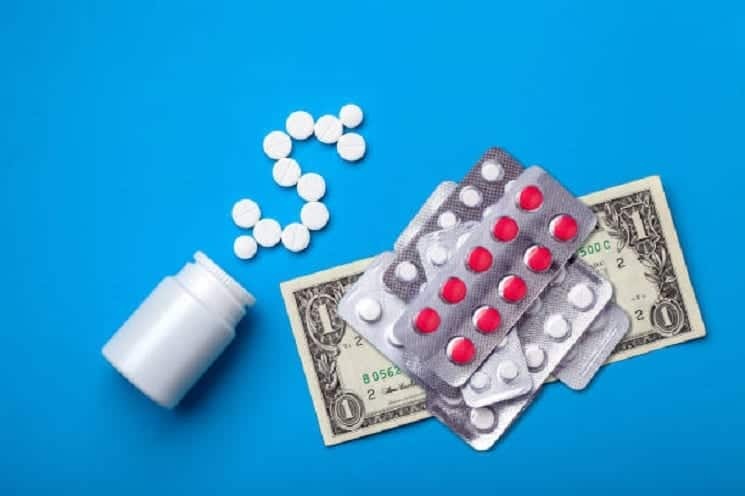 The Together Rx Card – issued by Abbott Labs, AstraZeneca, Aventis, Bristol-Myers Squibb, GlaxoSmithKline, Johnson & Johnson, and Novartis – saves you 25 – 40 percent or more on any medicine these manufacturers make. Income limits are $28,000 for individuals, $38,000 for couples. Call 1-800-865-7211. Another resource you may find valuable: The Centers for Medicare and Medicaid Services help senior citizens with answers to their prescription medication questions. Call 1-800-MEDICARE. A new phenomenon is a nonprofit pharmacy. Run by volunteer retired pharmacists, they also do free deliveries. See if there isn’t one in your area. If you’re a retired druggist, start one. Finally, the senior HMOs are back, now with more generous benefits. With millions taken from Medicare, the Bush Administration is increasing funding by up to 22 percent for companies like Humana, UnitedHealthcare, WellCare and others competing with traditional Medicare. Some now offer generics with a small copay. But be careful! You lose your choice of doctors, and though they make it sound like a real deal, often Medicare is still your best bet, even without drug benefits. Remember, Medicare won’t drop you. Details are at Medicare.gov. Just enter your ZIP code. FOR THE BEST INFORMATION ABOUT SUPPLEMENTAL INSURANCE OPTIONS, THE MEDICARE ADVANTAGE PROGRAM, LONG-TERM CARE ISSUES, AND A STATE-BY-STATE LIST OF KEY AGENCIES THAT CAN ANSWER SPECIFIC QUESTIONS ABOUT MEDICARE, MEDICAID, SUPPLEMENTAL COVERAGE, AND LONG-TERM CARE, GO TO KAISER FAMILY FOUNDATION. For generics, always check Costco first. I’ve saved almost 90 percent buying generics at Costco instead of chain drugstores. No membership is necessary. If you have no Costco, check Sam’s Club. Always compare drug prices at companies’ Web sites. It takes so little time to save big bucks. One more thing. If your annual income is less than about $14,000, you’re probably eligible for free drugs from most manufacturers. Annual income must be at or below the federal government poverty level, a place where over 10 million seniors reside. TO SEE ALL PATIENT ASSISTANCE PROGRAMS, GO TO SUDDENLY SENIOR’S DRUG ASSISTANCE PAGE. Get discounts from 15% to 65% at over 35,0000 pharmacies with the OmniChoice Prescription Drug Card. Costs only $7.95/mo. OmniChoice is an advertiser at Suddenly Senior. An easy way for lower-income seniors to get free drugs is through Free Prescription Drugs at Discount Rx. Simply complete a list of all your prescriptions. Send it in with $5 for each medicine. They send back each specific manufacturer’s forms for free drugs. Carolyn and I have saved literally thousands of dollars – almost always 40 to 90 percent of US drugstore prices – buying branded drugs from licensed Canadian pharmacists. In spite of what the FDA and Big Pharma would like you to believe, it’s not only cheap but also safe and dependable. Even the FDA admits that they’ve found no evidence of any American ever sickened or who died from prescriptions filled by a Canadian pharmacy. Nor is it strictly illegal to buy in Canada if you are purchasing for your own use with a US doctor’s prescription from a licensed Canadian pharmacist. [See FDA Advisory HFC-170, 4/3/98.] Over a million of us do just that. No one has been arrested yet. In fact, most HMOs, including Blue Cross and AARP, will reimburse for drugs bought north of the border. Soon, I will do an entire column about buying drugs in from our Northern neighbors, hopefully clearing some of the deceitful and shameless fog emitting from FDA/Pharma Lie Machine. In the meantime, there’s lots of valuable information about buying from Canadian pharmacies in Canada: Your Prescription for Lower Drug Prices. Remember: The most effective drug in the world is useless unless affordable. * Generally, you can have no more than $3,000 is assets to be eligible for Medicaid. Complete information is at Center for Medicare & Medicaid Services. Here’s how you can help bring down Rx prices.